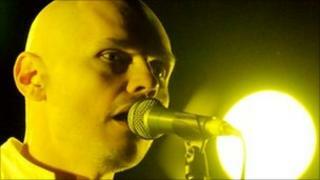 Smashing Pumpkins frontman Billy Corgan collapsed on stage during a gig in Florida on Thursday night. During the band's performance of 1995 hit single Bullet With Butterfly Wings, the star fell to the ground. Writing on Twitter later that night, the musician said: "That wasn't a stage move or clumsiness. That was me blacking out and wiping out." The 43-year-old, who said he was bruised by the fall, gave no explanation for his collapse. "I have no memory of falling against the drum riser and my guitar cabinet, but I can tell you I've got quite a good bruise [and] am moving slow," he added. The Chicago band, who found success with a string of psychedelic alt-rock albums in the mid-90s, are scheduled to play a show on Friday in Tennessee.